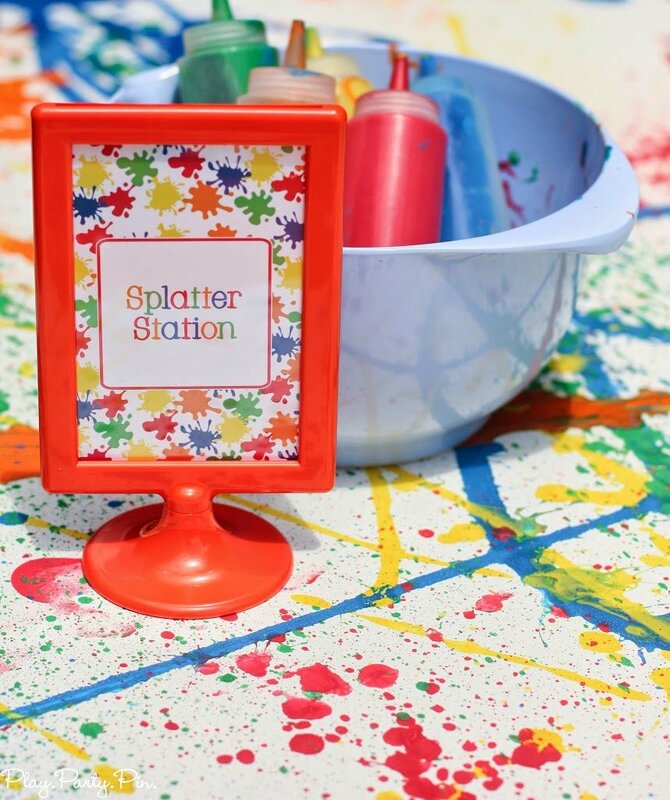 These art and splatter paint party ideas are perfect for a summer backyard bash, for a back to school party, or a birthday party for art-loving kids! 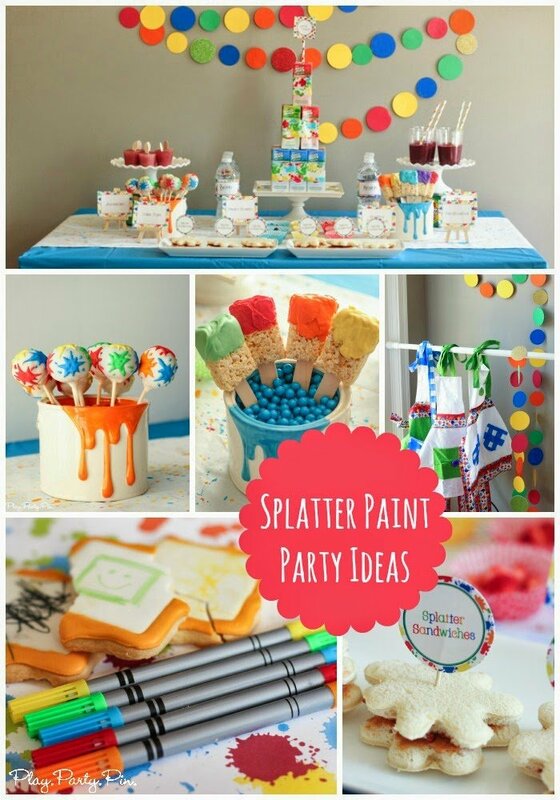 With easy art party foods, paint party games, and more you’ll find everything you need for an amazing splatter paint party! 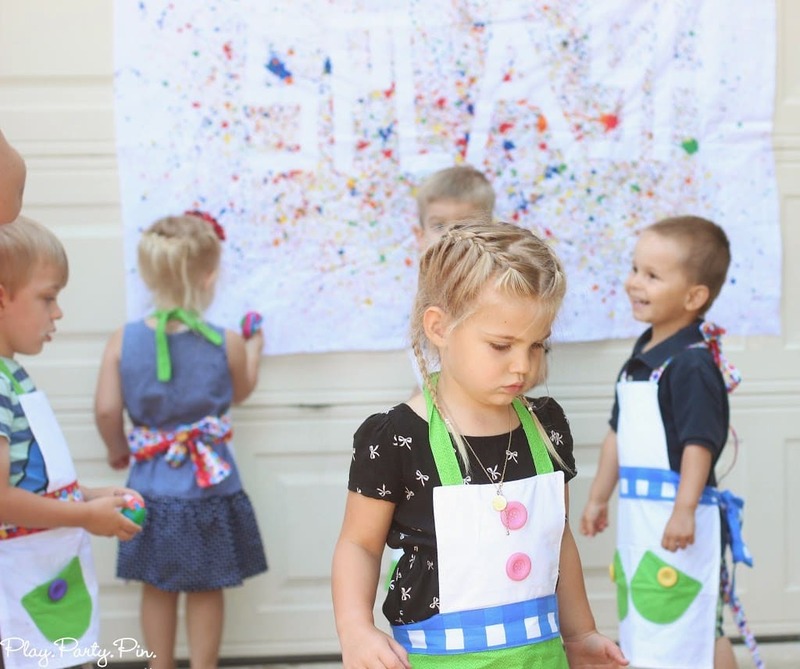 When everyone arrived, they were greeted with a cute splash zone sign on the front door, warning them of the messy fun ahead. Isn’t this sign so cute? 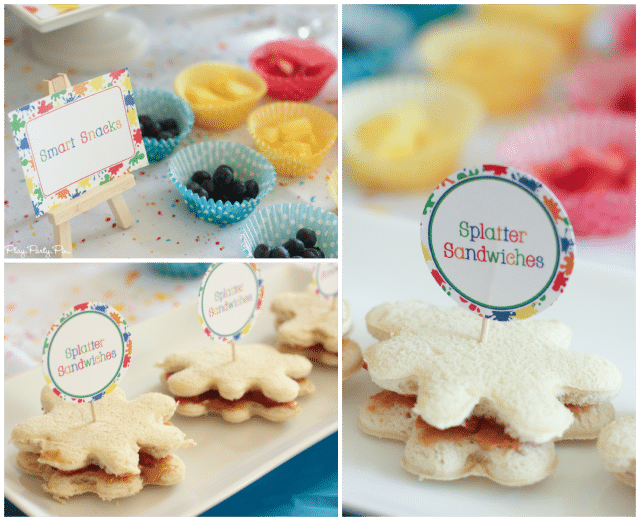 All of the printables from the party were designed by Swish Printables. A good party starts with yummy food, and we had plenty of it. Since the party was for 2-4 year olds, I specifically picked out food items that I knew were good for that age group. I also decided to go with a cheap plastic tablecloth so it didn’t matter if it got ruined. Adding a splatter paint table runner from Cupcake with Character made my plastic tablecloth seem more exciting than it really was. And plus, when the kids spilled on the table runner, you couldn’t really tell because it was covered in splatter paint anyway. Perfect! Because I wanted the party to have a fun feel to it right away, I tried my best to make the table super colorful. 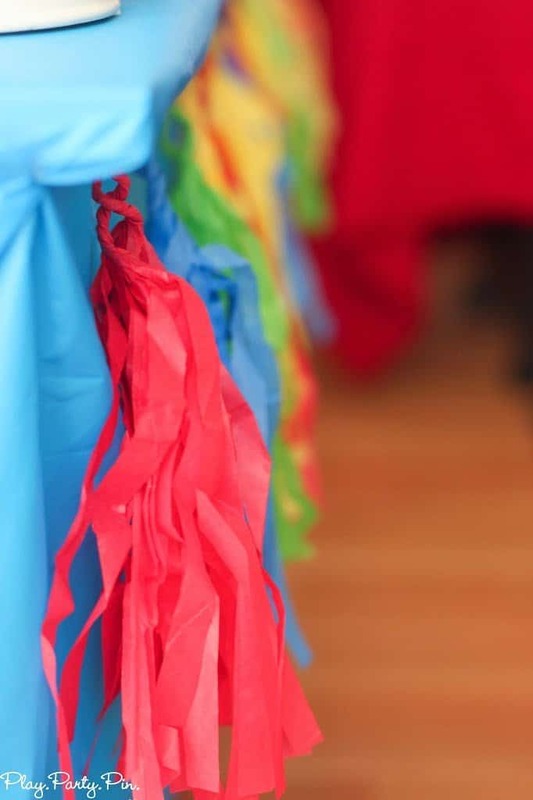 The colorful tissue and circle garlands from Fancy and Fold were the perfect way to do that! For the actual food, I went with simple things that I know most kids like starting with peanut butter and jelly splatter shaped sandwiches. One of my favorite party food tricks is to use a cookie cutter to make something go from ordinary to memorable like I did with my turkey cheese and crackers. 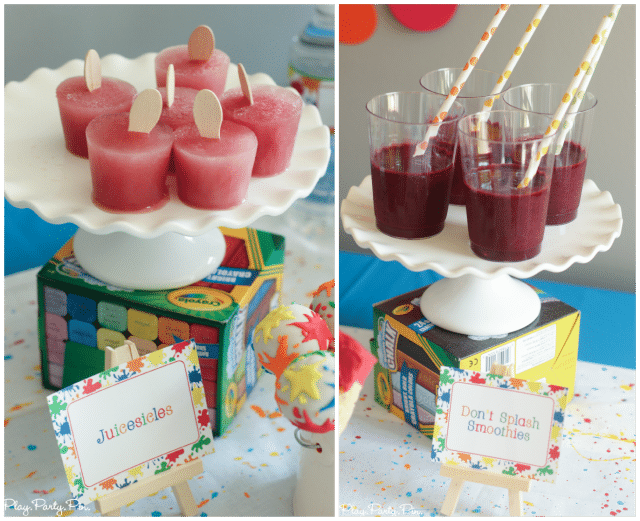 I also wanted to give them some smart snacks to go with their sandwiches so I served fresh fruit in colorful cups to match the rest of the bright colors. I also served don’t splash smoothies that I made with frozen fruit, Juicy Juice, and ice. 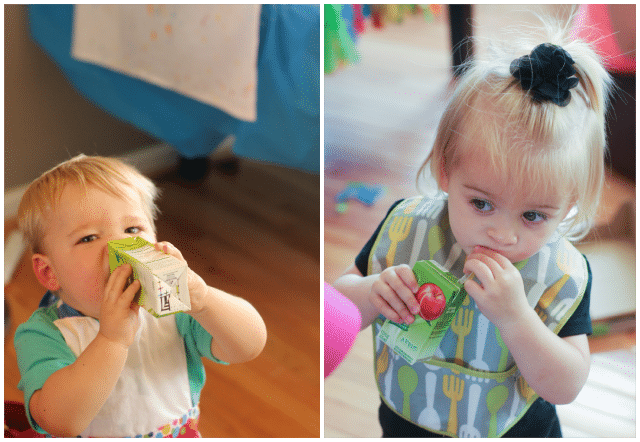 And on the other side, juicesicles to keep the kids cooled off. 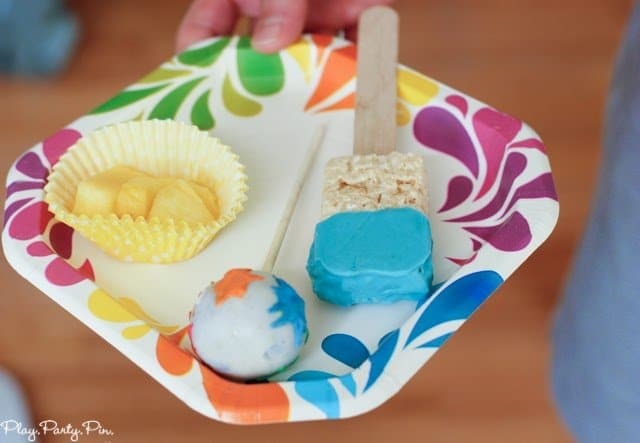 Another fun party tip, think outside of the box when it comes to using ingredients. Juice doesn’t just have to be served as juice; it can also be turned into smoothies and popsicles! 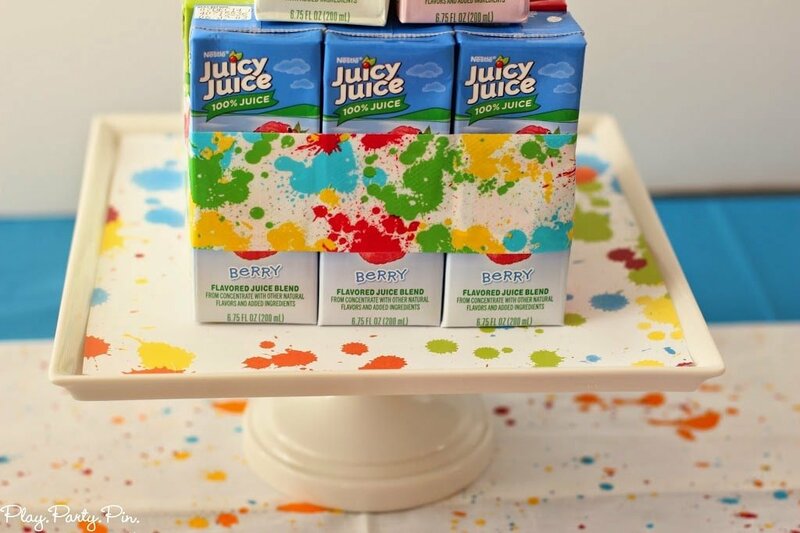 Or stack juice boxes up and turn them into a cake like this one with a little splatter paint tape. 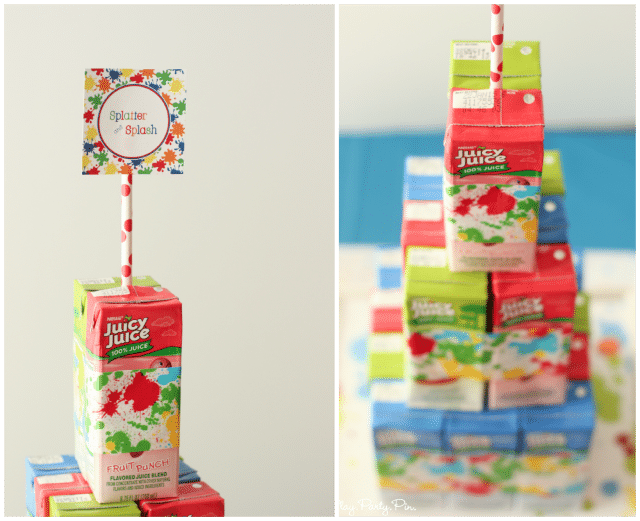 All I did was stack the juice boxes together, wrapped them up in splatter paint duct tape that I got from Oriental Trading Company (isn’t it perfect for this party?? 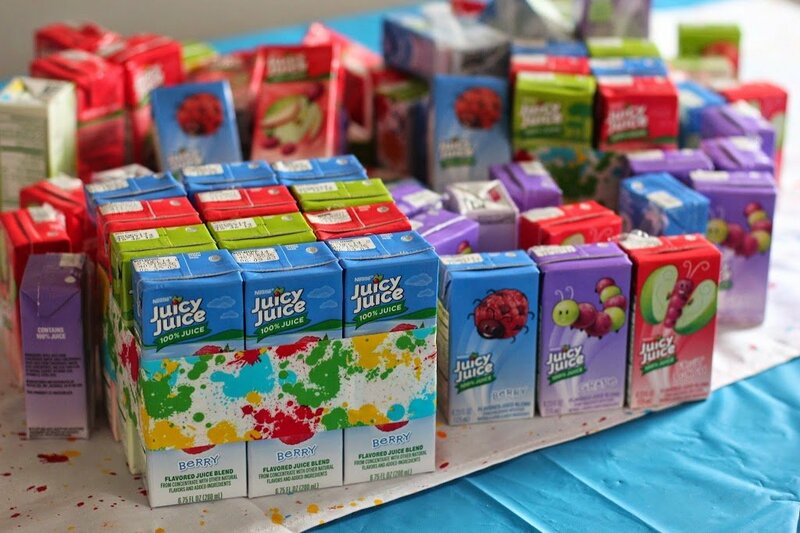 ), and decreased the number of juice boxes for each layer. And to top it all off, I added one of my cute striped straws and a cake topper. 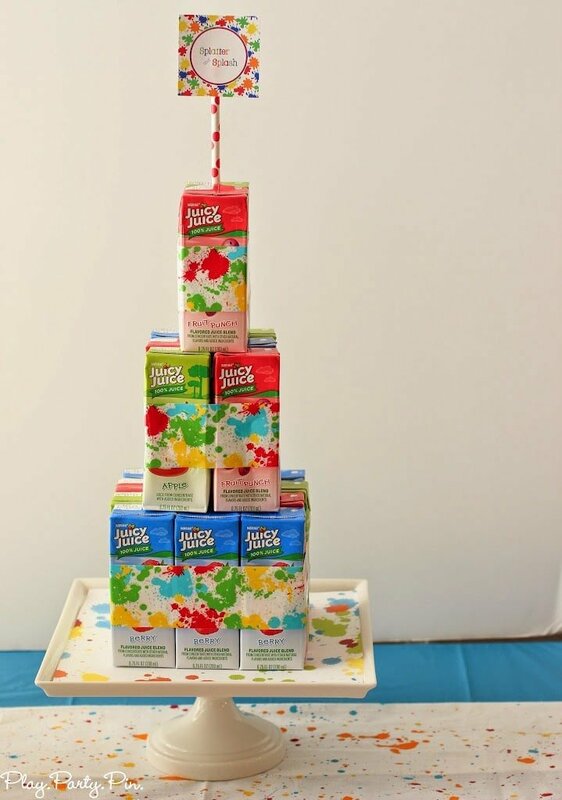 So easy, and if you wanted to actually serve the juice boxes this way, you could easily skip the tape step and just serve the juice boxes from the cake. 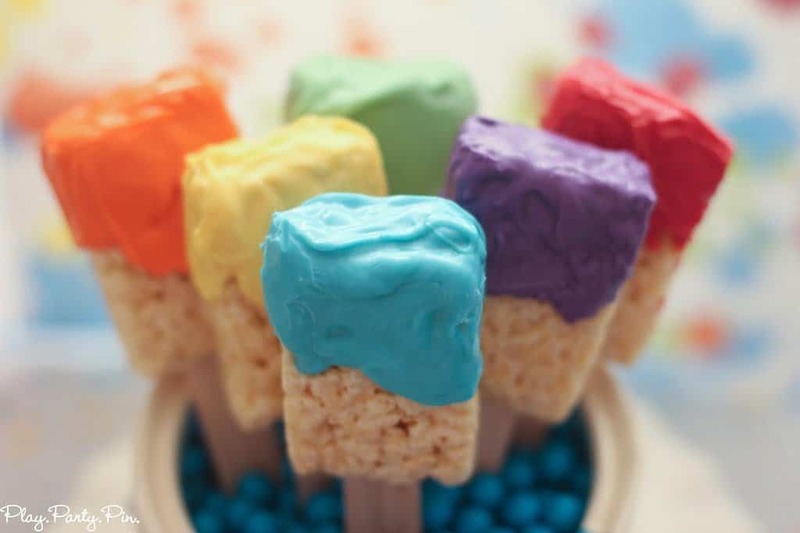 And my favorite, rice krispy treats that Nicole from Sweet U Off Your Feet made to look like paintbrushes. I mean seriously, how cute are these? I love how they look in another of my spilled paint jars. And they were so yummy too! 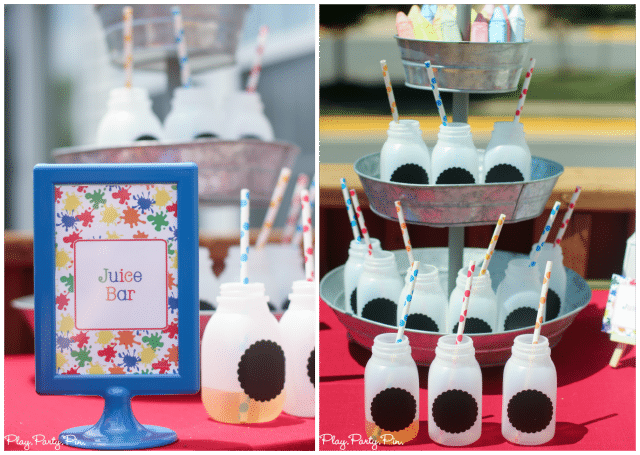 Now of course you can’t serve food without drinks, especially when you have kids playing outside in the hot sun, so I created a cute juice bar on my back deck full of yummy juice options. 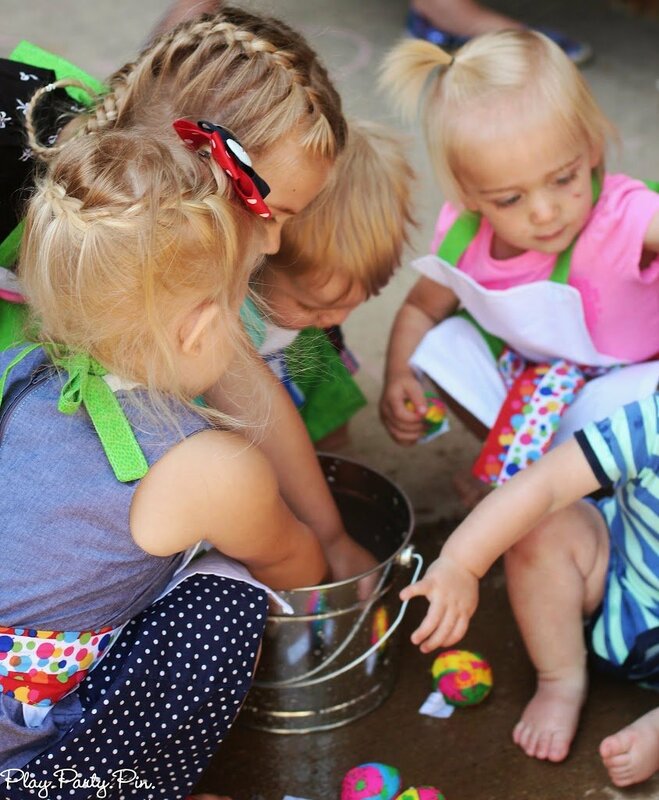 The kids were encouraged to make a splash, aka their favorite juice mixture. 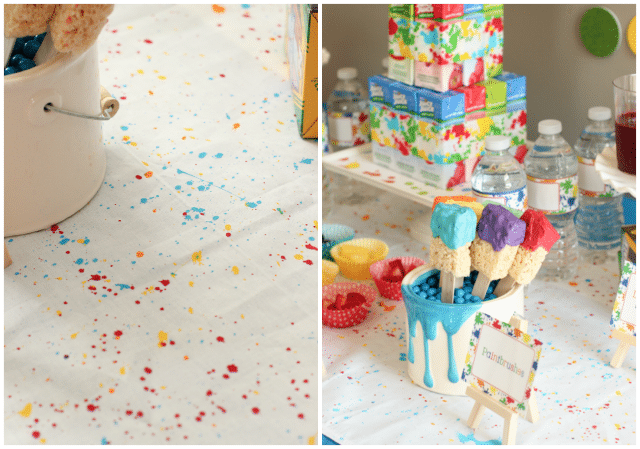 I just love how the custom bunting from Cupcake with Character turned out and combined my two themes – splatter and splash together. 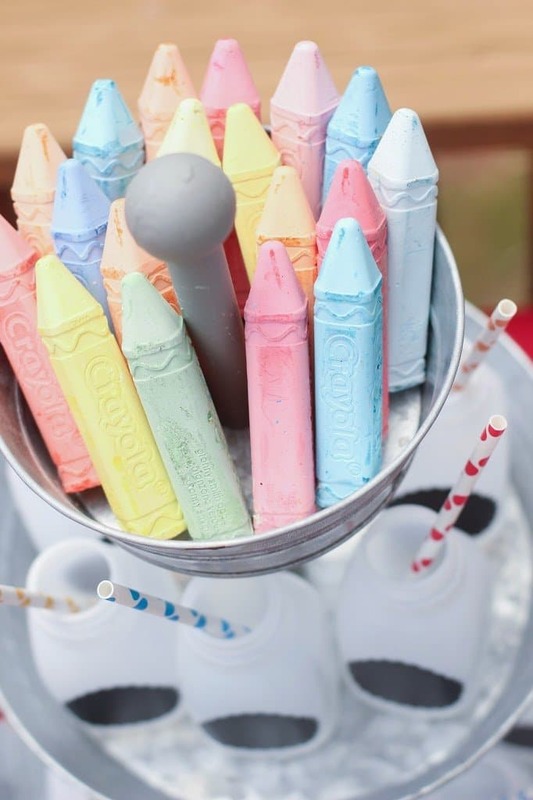 Rather than using regular cups, I gave the kids each a bottle with a chalkboard label on it so that they could write their name on it with Crayola sidewalk chalk to remember later. After the kids had eaten their lunch and were nice and hydrated, we started into our afternoon of “learning through play” activities. It’s pretty funny how kids may not like practicing their letters or colors normally but turn it into a game, and they love it. That was my goal when I was coming up with all of these activities. 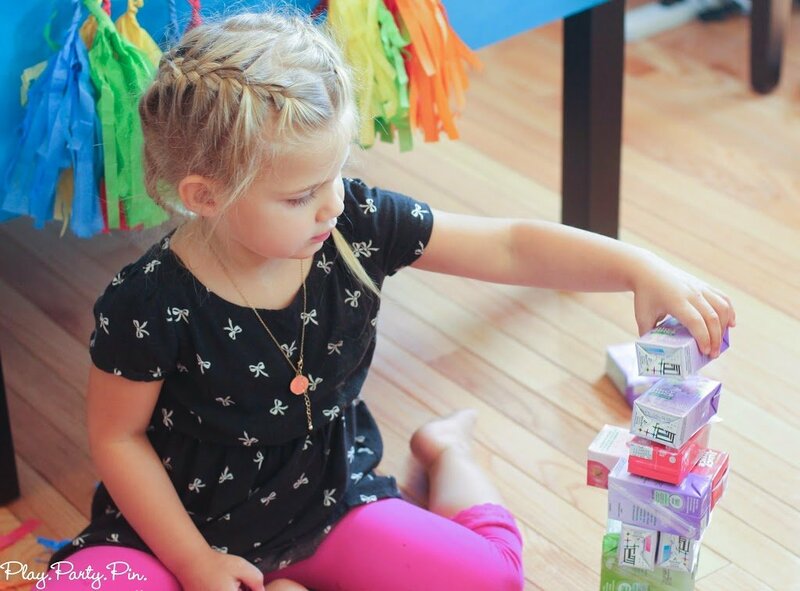 First up, we started with a little juice box Jenga, or for most of the kids, building towers out of Juicy Juice juice boxes. 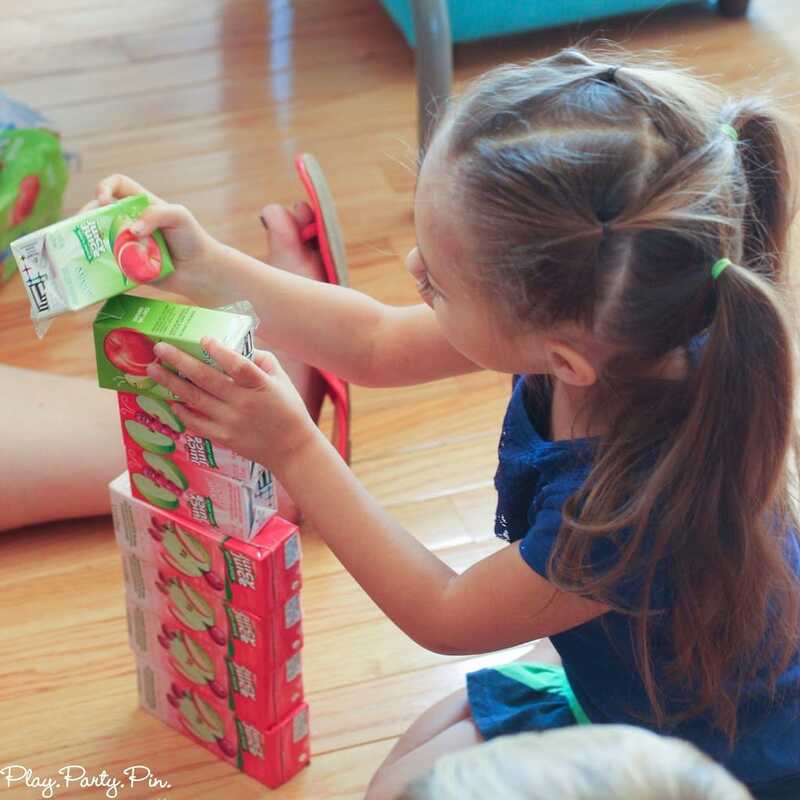 Juice boxes make perfect blocks, and the kids had a blast seeing who could build the biggest tower. And who could keep the little kids from knocking their tower down. 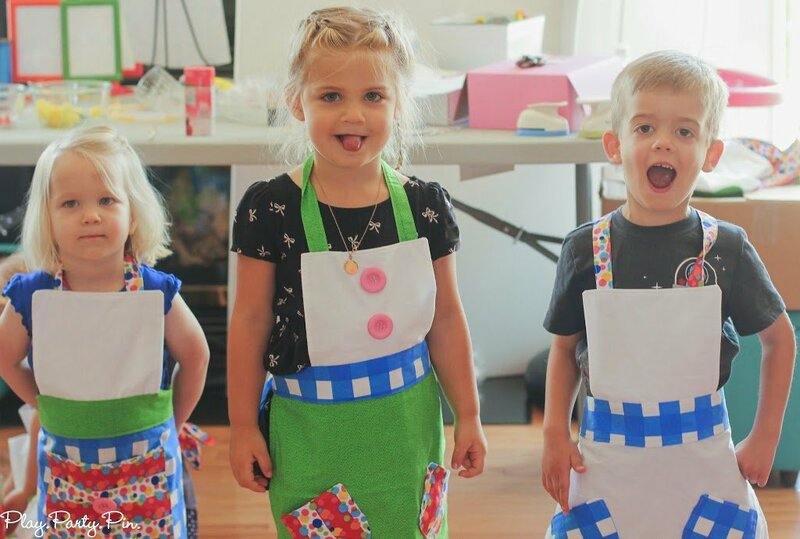 Before the next activity, each of the kids was given a darling art apron made by the talented Megan from Confetti Couture Events. 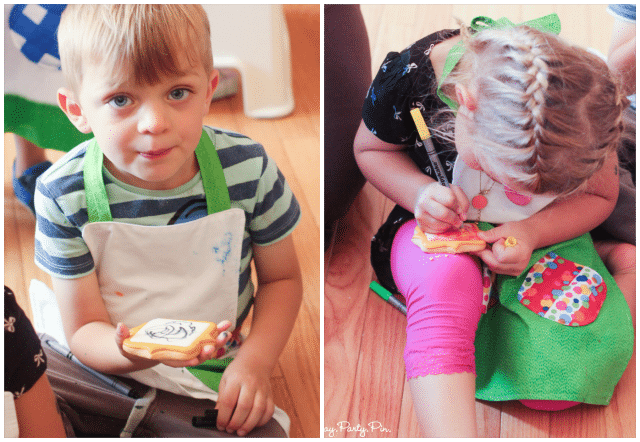 The kids loved picking out their favorite apron from the various designs and sorting through the different sizes (another learning activity!). 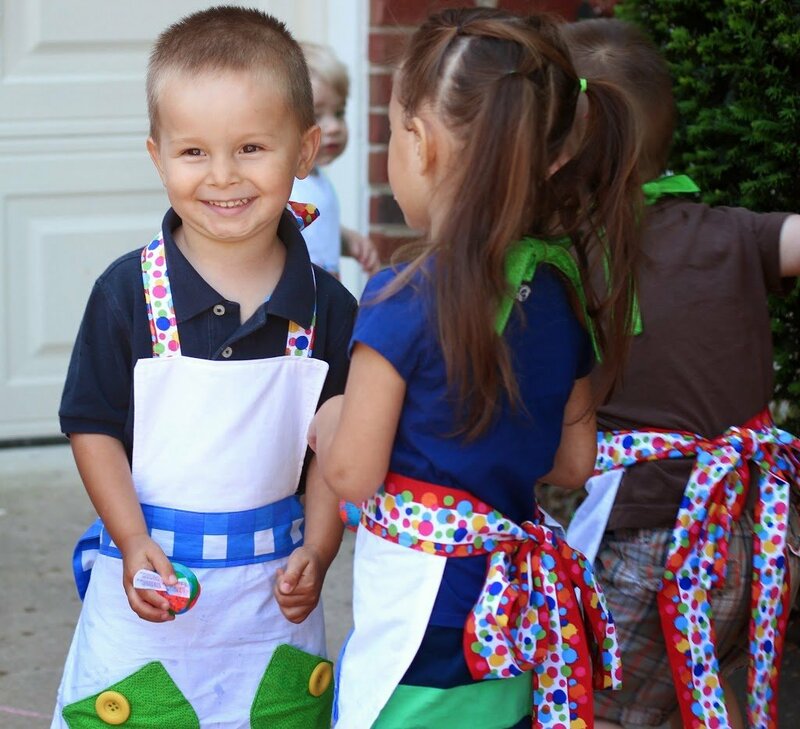 I love how Megan made the aprons work well for both boys and girls with the gender neutral colors. 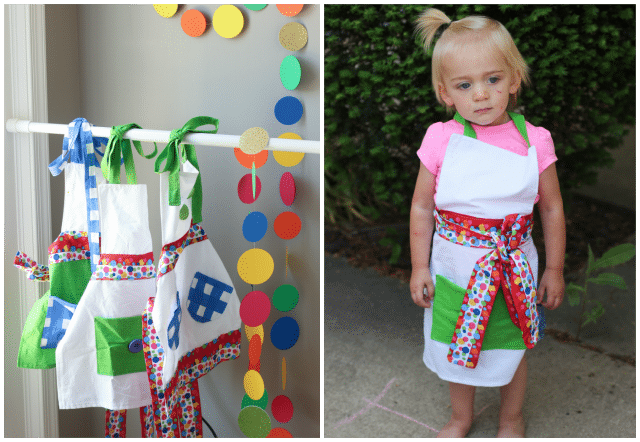 And bonus, kids went home with messy aprons, not messy clothes. After the kids were all prepped to get messy, we went outside. Before the party, I wrote out the alphabet on the driveway using Crayola sidewalk chalk. 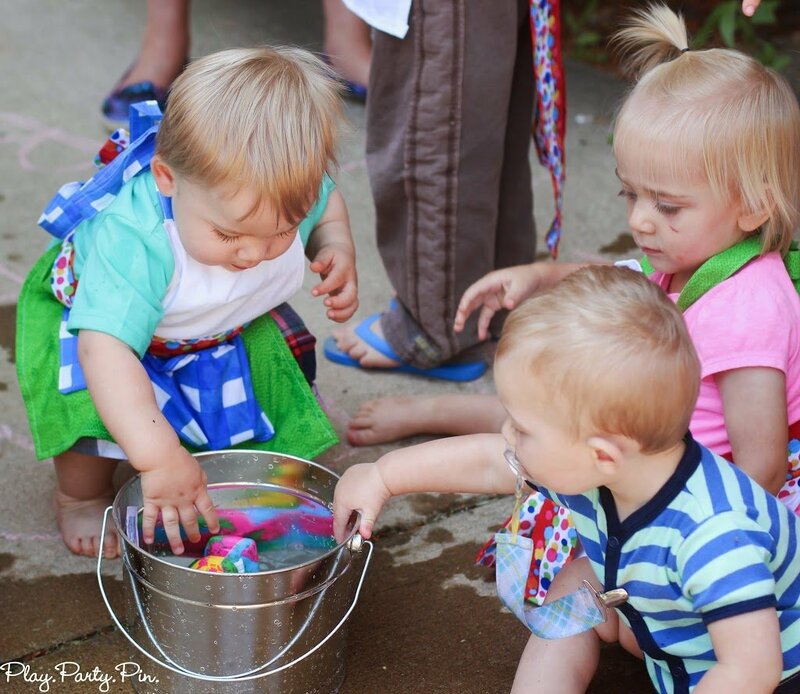 For this activity, each of the kids had to grab a splash ball out of a bucket filled with water, throw the ball in the air, and say the letter the ball landed near. This worked great for this age, but you could easily adapt this for older kids by having them come up with a word that starts with that letter or even do numbers and make them add the two numbers together or something. The idea is just to combine an element of letters/numbers with the fun of water and throwing the ball. It’s amazing how much fun kids can have with just one simple bucket of water and some balls. When they had done enough letters, they made up a new game with the guidance of another parent and started throwing the splash balls at the splash banner I made for the party a couple of weeks ago. And the kids like K who weren’t big enough to understand what we were doing still had a great time just playing in the water. I’m actually really surprised the water didn’t get all dumped out before it did. Once the kids were tired of splash ball, we moved into the backyard where I had another fun surprise for the kids. 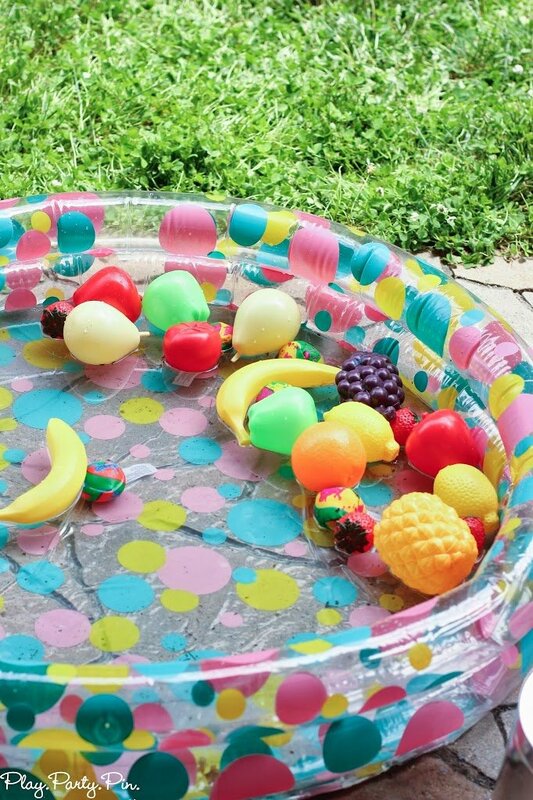 I filled a kiddie pool from Oriental Trading Company with water and plastic fruit. 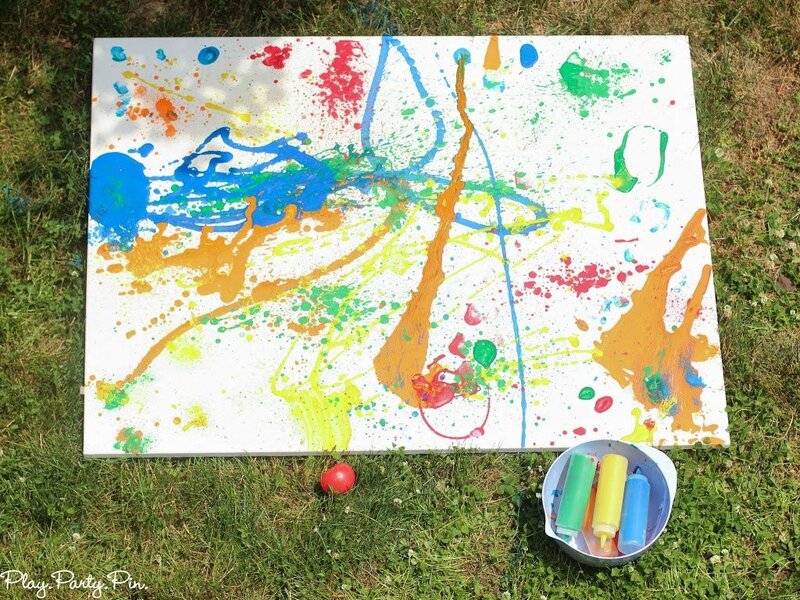 On the other side of the yard, I had a large blank canvas and a bucket of squeeze bottles filled with Crayola Kids Washable Paint mixed with a little bit of water. 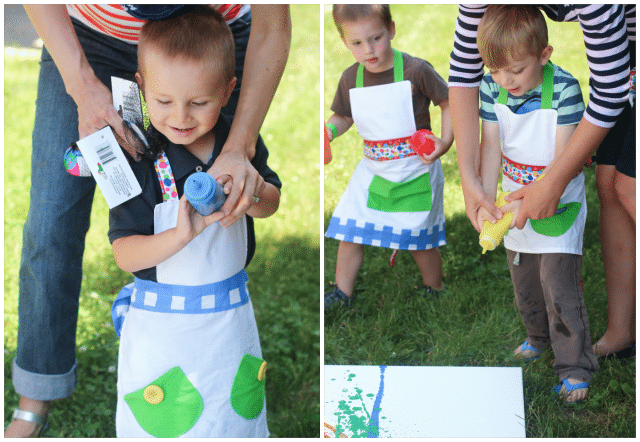 The Crayola paint was perfect because it applied well to the canvas but will wash out of the kids’ clothes. I told the kids to pick a fruit from the pool then to go to the canvas and find the color of paint that matched their fruit and squeeze a little bit of the paint on to the canvas. Once they’d added some paint to the canvas, they had to go pick another fruit and start again. 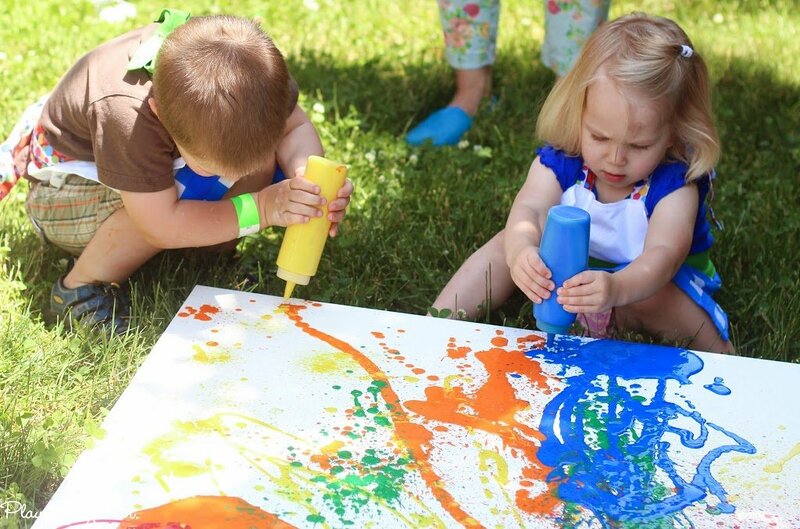 It was such a fun way to get kids to practice their colors while still having a great time, and I loved seeing all of the kids “painting” the canvas together. 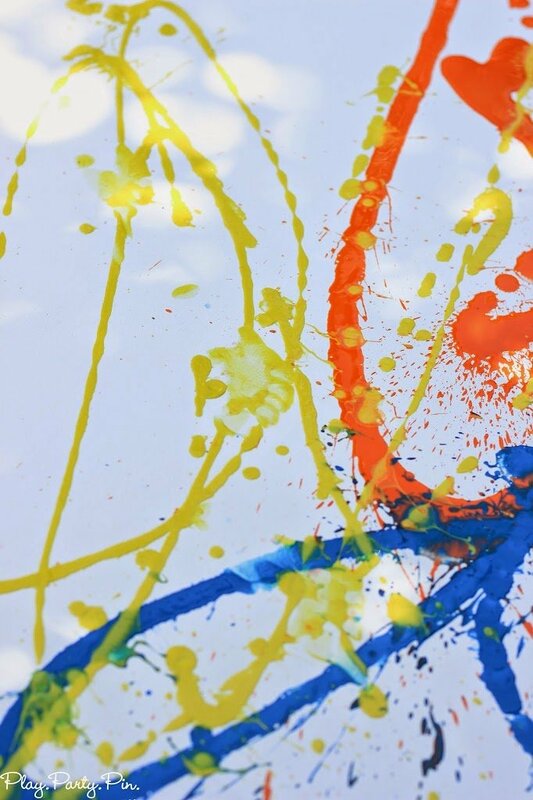 My favorite part of the splattered paint canvas has to be the little footprints. I bet you’ll never guess whose those are? I think all of the kids loved this activity and bonus, now I have a new piece of art for my backyard! After the kids had run out of paint, we went inside to finish up the party with a little cookie coloring. And yes, I said cookie coloring, not decorating. 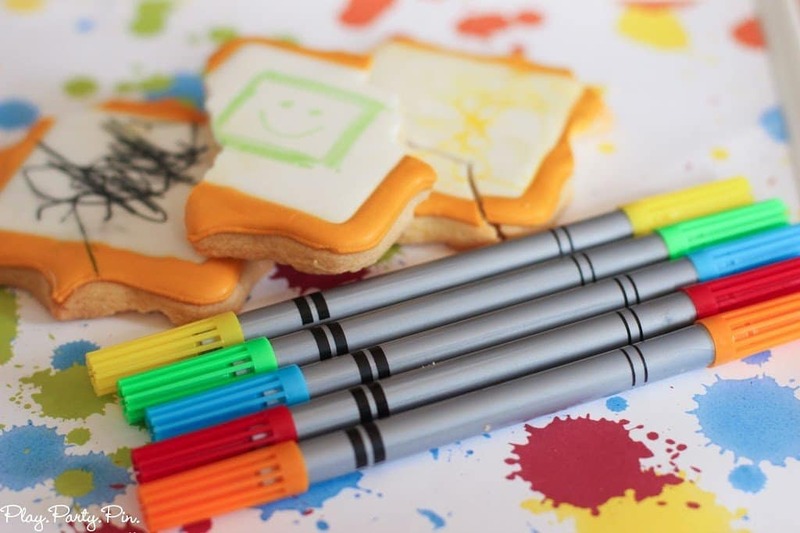 Shauna from Carabella Creations made these cute little picture frame cookies, and the kids colored on them using food safe markers from Kopy Kake. 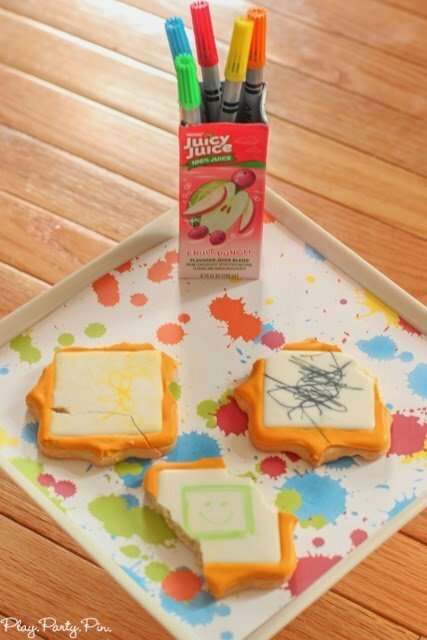 Juicy Juice boxes that are emptied, rinsed, and dried out are perfect for holding art supplies! It was such a fun way to finish up the day and another thing that the kids absolutely loved. I tried to get some pictures of the cookie frames all colored, but the kids couldn’t wait to eat them and I ended up with pictures of lots of nibbled on cookies. 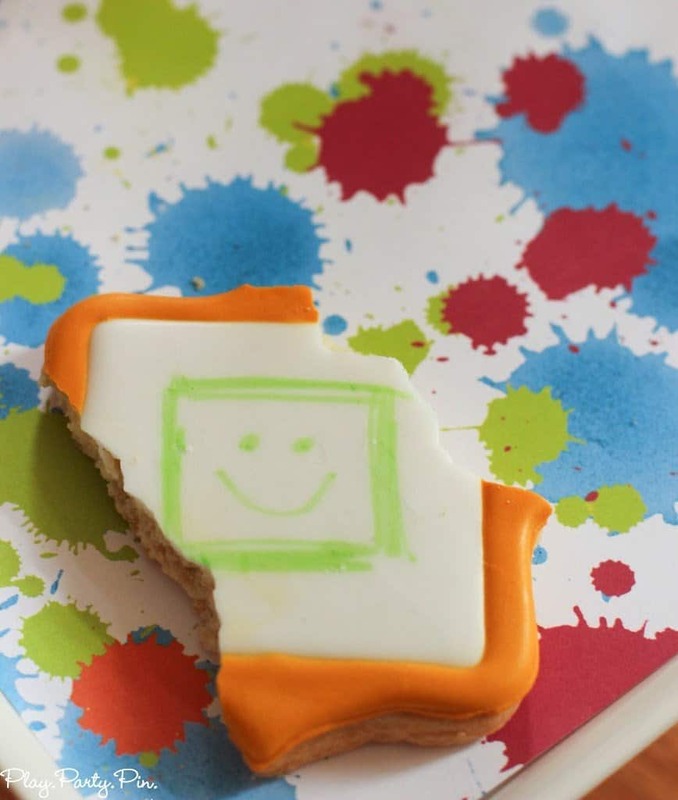 I think this cookie sums up the entire party nicely with a cute little smiley face. About the time the kids finished their cookies, we hit naptime for some of the younger kids and decided it was time to call it an afternoon. 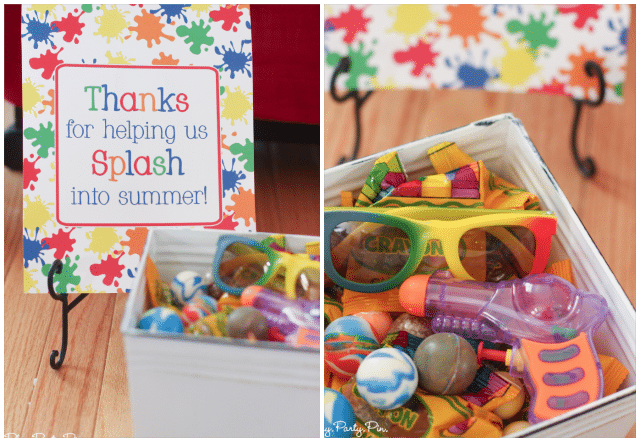 As a thank you for coming, each of the kids was given a bag full of all sorts of goodies for having their own splatter and splash bash at home. 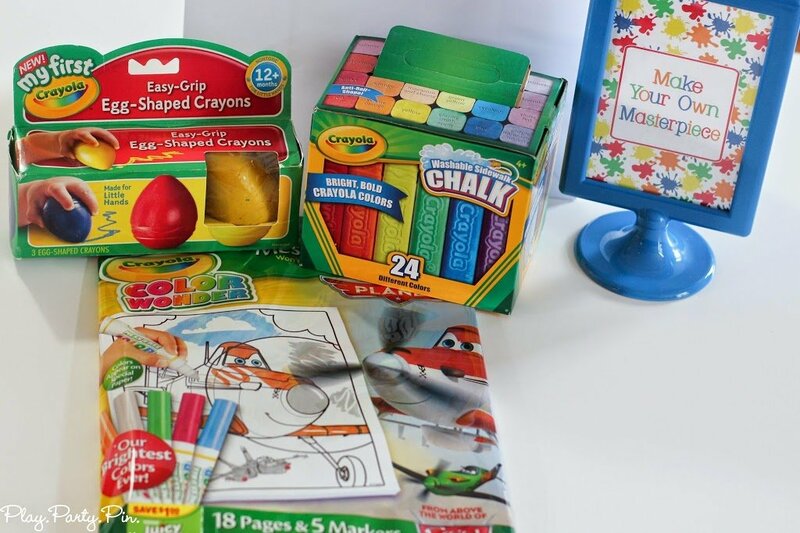 Each of the kids was first given their choice of My First Crayola Crayons, Color Wonder Overwraps (no mess, yay! ), or Crayola Sidewalk Chalk. 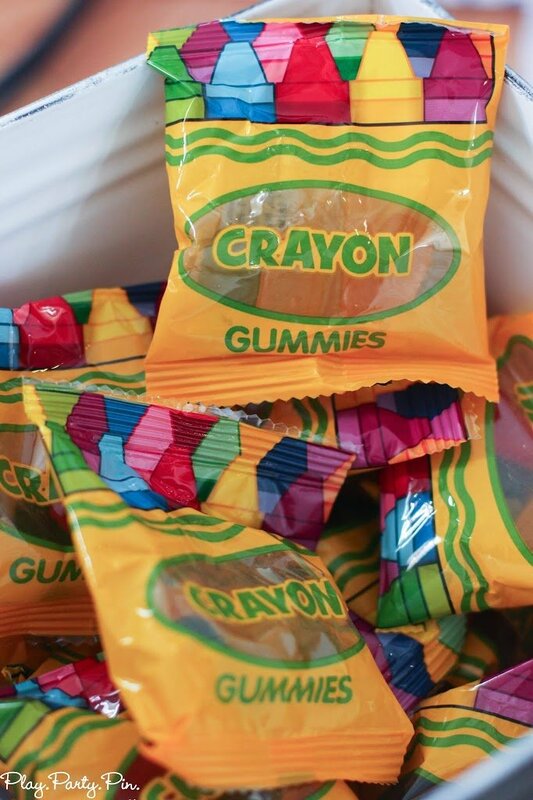 The bags also included these crayon gummies, squirt guns, and bouncy balls from Oriental Trading Company. And of course, sunglasses! 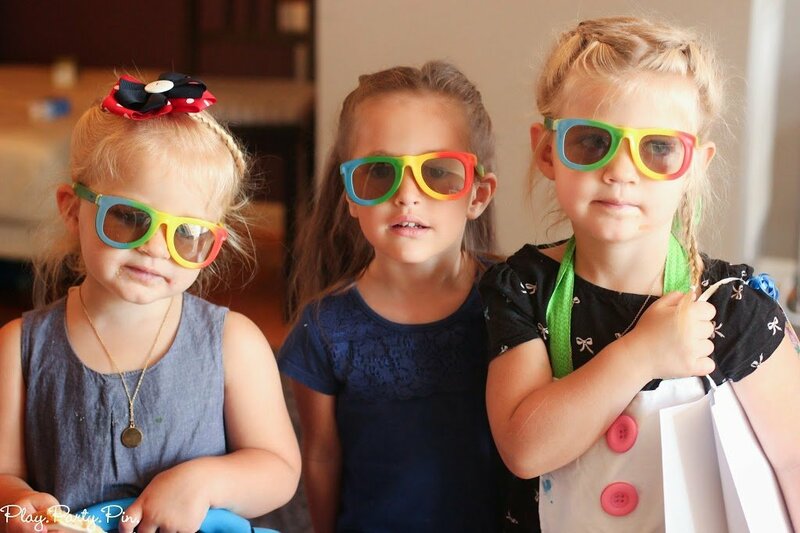 Aren’t these colorful glasses perfect? 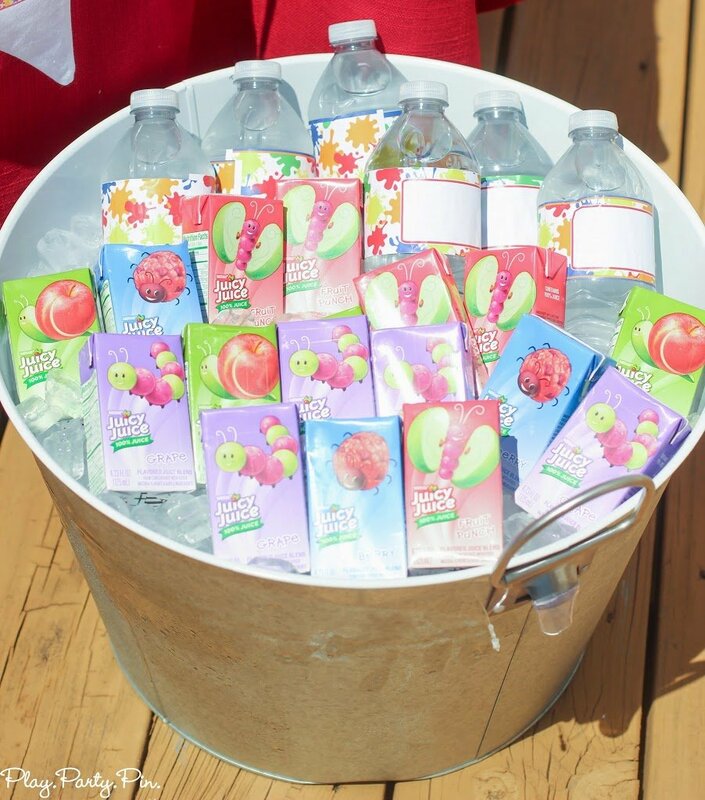 And last but not least, I sent each of the kids home with Juicy Juice boxes so that they could stay refreshed on hot summer days. What a cute cute party! I love it! Oh my goodness, everything about this is ADORABLE! Thanks Sara! I had so much fun planning this party. Thanks Stephanie, those are some of my favorite things too! Thanks Shauna! 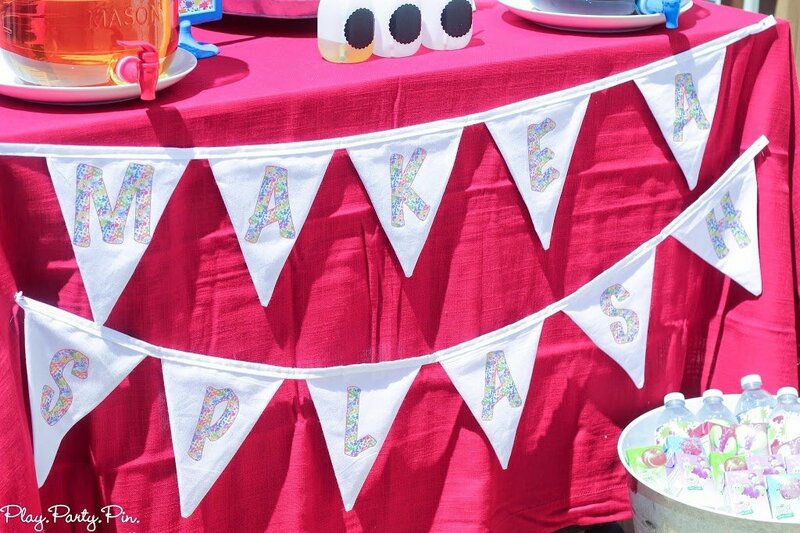 Your bunting and table runner were the perfect addition! SUCH a fun party! I’m loving every single little detail – great job! This is amazing!! You did an incredible job!!! cheers! Thanks Randi, it was pretty fun. Absolutely adorable! 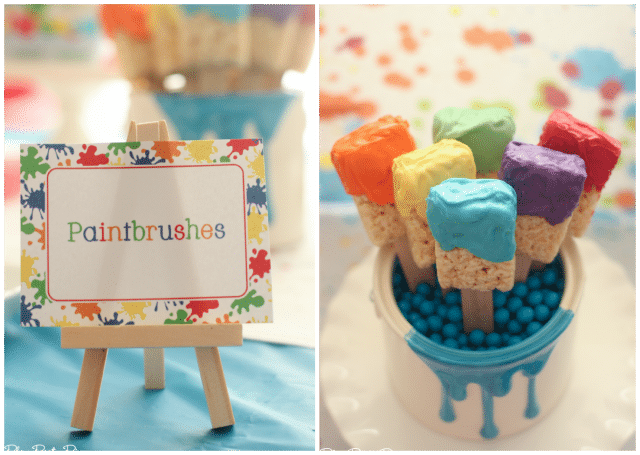 Love the rice crispy paint brushes!!! Thanks Mandee! They were absolutely delicious too. Love everything about this party! So fun! 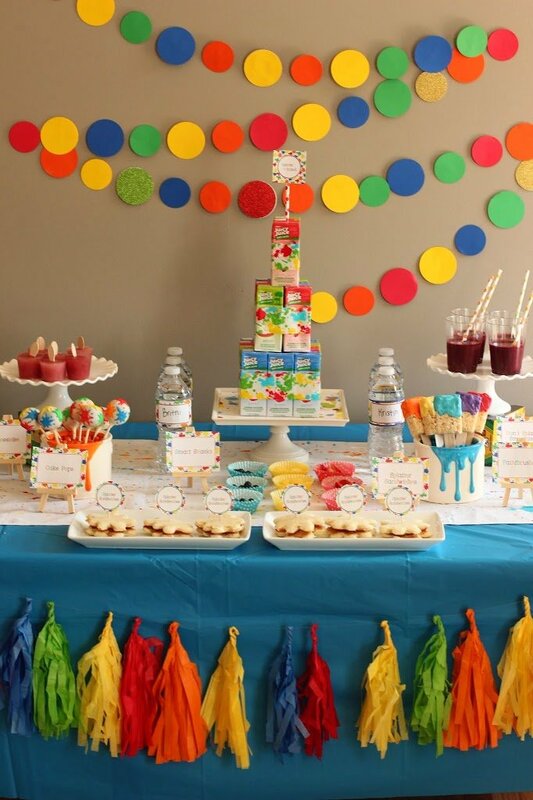 This is SUCH a cute party! 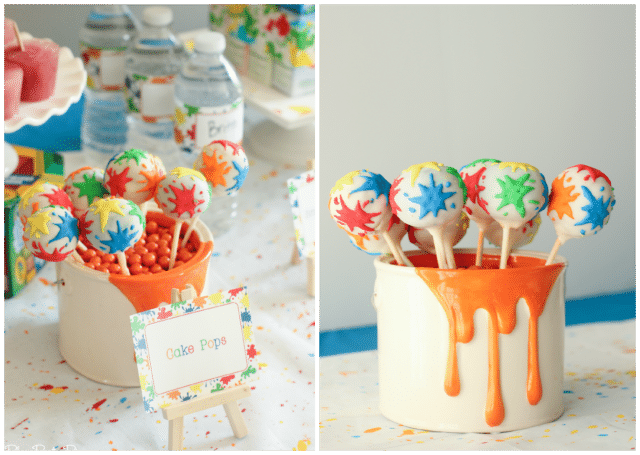 Love all of the details – and those cake pops are awesome! WOW! I love this idea! Amazing work lady! Oh my goodness! 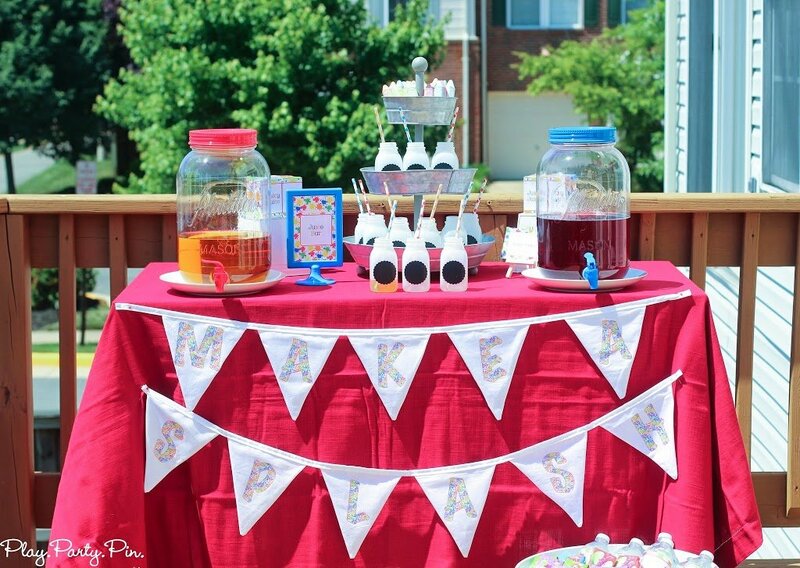 You should be a professional kids party planner! Everything is so colorful and creative – I can’t pick a favorite. Well done…pinned! So cute and creative! Love everything! Such insanely creative ideas! I was wondering: how did you make the spilled paint jars? I really love those…! I actually bought them at Michaels, perfect right? Do you recall where you purchased the mini easels from? website by chance (stumbleupon). I’ve book-marked it for later!